"Paperless Technologies is the first provider of a genuine solution that allows your office to become truly paperless." Paperless Technologies offers all of the software your office personnel need to eliminate paperwork and traditional paper files and turn solely to digital documentation and record keeping. Patient documents and questionnaires are designed to look and feel like the paper forms your patients are already used to filling out. To answer questions and give input, they simply select the multiple choice questions or write on the screen using the tablet pen. Checking-in couldn't be easier! Patients can easily check themselves into your office by providing simple patient information (their full name, phone number, or birthdate) or by using biometric check-in, scanning their fingerprint as their unique identifier. Eliminate the frustration parents experience when having to unnecessarily duplicate basic information (addresses, insurance, etc.) when filling out forms for their children. In PT, questions can be marked as "universal," causing the responses to automatically populate their children's forms as well. Parents can also complete all remaining questions for each child without having to log each child in separately. The Patient Queue shows your office staff where each patient is in his or her appointment. It keeps track of variables such as when your patients arrive, how long it takes them to complete their forms, who is treating them, etc. Know where your patients are at any time, and easily assign them to a care provider, different room, or review their personal information and history instantly. Paperless Technologies integrates with most practice management programs including Dentrix®, Dentrix Enterprise®, DSN®, Eaglesoft®, Easy Dental®, Practice-Works®, PBS Endo®, SoftDent®, Open Dental®, OrthoTrack®, and many others. There is no need to type or duplicate information between PT and your practice management program. Even the results from the forms your patients fill out will automatically be transferred into your practice management program, where applicable. Seamless information sharing is our goal. DataSync, an exciting and time-saving feature, makes a seamless integration between PT and your practice management software possible. Once a new patient has completed his/her forms, the data is prepared to be transferred into your practice management program from PT. Simply open the new patient in PT, click the "Sync with PMP" button, and DataSync automatically transfers all patient information that was captured during the registration. With DataSync you can avoid mundane, time-consuming manual entry and copying. Reduces or eliminates manual entry. Time necessary to register a patient greatly reduced. Reduces room for costly human error. With PT, all treatment plans from your practice management program are transformed into a treatment consent form with the click of a button. With the treatment consent form ready, your patients can sign right from the operatory or consult room. These forms can be mailed or printed directly from this area for your patients. 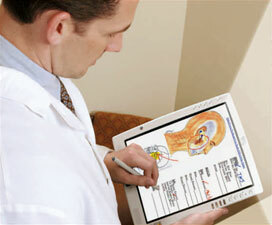 Any form can be turned into a digital clinical form to be used with digital ink, right on the tablet screen. 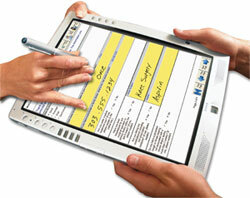 Paperless Technologies will launch your blank form, allowing you to complete and save it to your patient's file. 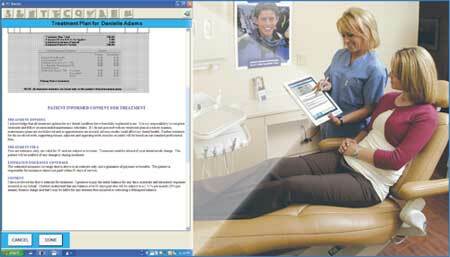 PT Dental and Medical Clinical Forms can function in a variety of ways. They can look and feel like regular paper, yet have the ability to convert handwriting to text or be operated in typing mode if one prefers to use a keyboard and mouse. Users can also attach graphical images as well as links to other programs and forms (i.e. patient education programs or electronic prescription forms) to increase clinical form functionality. 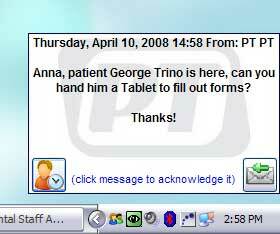 PT also includes a staff messaging system . This enables your staff to send electronic messages to each other within the office. Messages can be a typed, custom message, or can be selected from a list of preset messages and responses if it is more convenient than typing. An audible chime can also be attached to the message to alert the receiving user that a new message has arrived.